The new Charles Street bus bridge and busway officially opened on Sunday 25 June. The new infrastructure benefits more than 30 northern suburbs bus services, saving up to six minutes on peak hour trips. The $32.1 million project included construction of a 120-metre ‘bus only’ bridge over the Graham Farmer Freeway and the new Roe Street freeway off-ramp into Northbridge. Additionally, 500 metres of new bus lanes were created on Charles Street between Newcastle Street and Janet Street in West Perth as part of the project. QTM Electrical played a major role in the project which included the modification of four intersections including the complete rebuild of Newcastle and Charles Street. 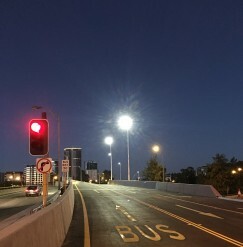 We also installed a new intersection for the new freeway off-ramp to Roe Street, new LED street lighting for the busway and upgraded Main Roads’ fibre network in the area. “Providing dedicated public transport infrastructure is key to increasing the community’s use of buses and reducing reliance on private vehicles,” said Transport Minister Rita Saffioti. “About 16,000 passengers and 1,200 buses will traverse the bridge and busway each day, alleviating traffic on other CBD roads and shaving up to six minutes off peak hour trips. QTM Electrical Operations Manager Matt Bendall said that this project was a considerable one for the business. Construction will continue on a bus storage facility off James Street in Northbridge and new accesses from the bus bridge to this facility, both scheduled for completion in August.